If your business is relying on older wireless infrastructure it is probably time to upgrade. Wireless traffic is only going up, not only is the demand from each device going up, each person typically has more devices - laptop, phone and tablet etc! On top of that, nearby wireless access points, bluetooth and other wireless peripherals all compete with you for the limited amount of wireless bandwidth. Enter "5GHz". The "5GHz" band has a lot less devices competing. Typically 5GHz has a smaller range than 2.4GHz, which counter to what you would expect is actually a benefit. It means there are fewer devices competing within an access point’s reach. 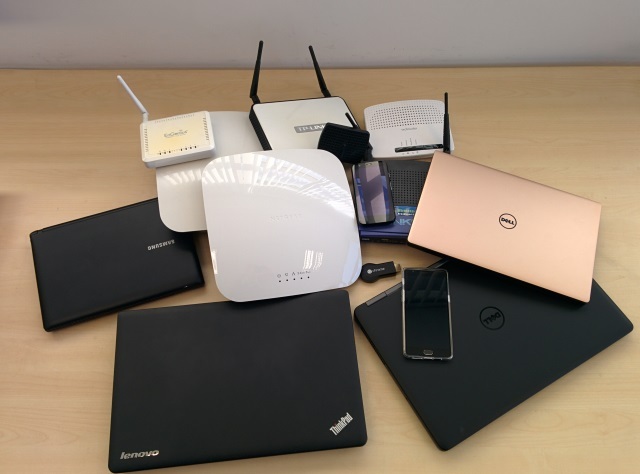 Any laptops, phones and tablets replaced within the last few years probably already support the latest wireless protocol 802.11ac which uses the 5GHz band, why not update your wireless infrastructure to support them? Wireless 802.11ac infrastructure is also now quite reasonably priced. If your organisation already has a wireless network, or if you're thinking of setting one up, you'll want to make sure you protect your systems from viruses and other nasties, even when your staff and visitors connect to your network with their personal devices over which you have no control. Malware could be running on their devices without their knowledge; it's more likely than not. So what are your options?